The oldest remains of placental mammals until recently were teeth and jaws from the very top of the Early Cretaceous, and the record improved only in the Late Cretaceous. A new specimen from the famous Liaoning deposits in China has changed all that (Ji et a/., 2002). The new placental, called Eomaia ('dawn mother'), dated at about 125 Myr ago, is some 50 Myr older than the next oldest complete eutherian skeletons from the uppermost Cretaceous of Mongolia. Eomaia is a shrew-sized animal, some 16 cm long and weighing in life perhaps 20g. The exceptionally well preserved fossil shows that Eomaia had hair, which is not a surprise. 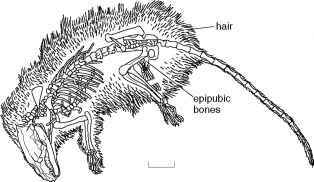 It also retains the epipubic bones that are typical of modern monotremes and marsupials, but are lost in modern pla-centals (see p. 306). Eomaia was an agile little animal and it might have been a climber—its finger and toe bones are long and the claws are strongly curved and laterally compressed, features that help in grasping twigs. Eomaia lived side-by-side with other mammals that belonged to now-extinct groups, such as the triconodont Jeholodens (see p. 304), the symmetrodont Zhangeotherium (see p. 305) and the earliest metatherian Sinodelphys (see p. 308). Why Eomaia founded such a successful clade that came to dominate the land and the others died out is hard to discern. In the skeleton, the vertebrae of the neck are broad low-spined elements. The atlas forms a fused ring (Figure 10.14(f)) with broad facets on either side for the two occipital condyles, and the axis has an unusual long spinal process. 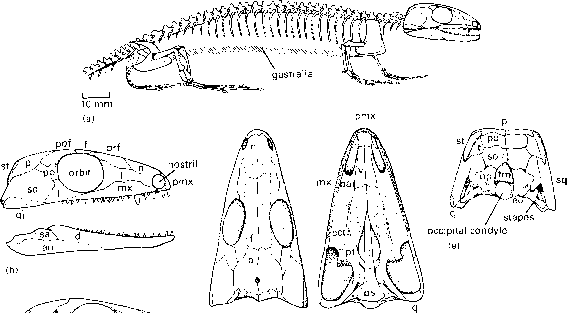 (Figure 10.14(a)), but it shows evidence of the mobile structure seen in modern marsupials and placentals. Advances include the loss ofthe coracoid bones and the interclavicle. The scapula also takes on an entirely new form, better seen in a modern therian mammal (Figure 10.14(g)). The scapular blade is divided in two by a sharp ridge or spine that ends in the acromion process to which the clavicle is attached. The fields in front of the spine and behind it bear major new muscles that move the arm back and forwards with the elbows tucked well in. Further features that relate to erect gait (and that are known earlier in Zhangeotherium) are that the humerus head fits into a glenoid that faces downwards instead ofoutwards as in early mammals, and the elbow joint is hinge-like. The hand (Figure 10.14(h)) has long digits. Although the zalambdalestid arm shows many new features, the hindlimb is rather like that of earlier mammals. It seems that erect gait was achieved in the hindlimb by derived cynodonts in the Triassic, but in the forelimb only much later by Late Cretaceous marsupials and placentals. The foot of Zalambdalestes is long. In the ankle, the calcaneum has a long 'heel' (Figure 10.14(i)) and the astragalus sits on top of it, out of contact with the ground, as in modern placentals. The fibula is reduced to a thin splint and is largely fused to the tibia. Zalambdalestes is interpreted as a specialized ricochetal mammal that made great leaps using its powerful hind legs. The placental mammals of the Cretaceous largely belong to extinct groups, but some modern clades were also represented. Most dramatic were the zhelestids, a family of some 15 species, known first from the Upper Cretaceous of Uzbekistan, some 85-90 Myr ago (Archibald, 1996b, 2003), and then from younger beds in North America and Europe. The zhelestids were small animals, with skulls perhaps 10-30 mm long, which are known from teeth, jaws and bones from the ear region. They belong to the major clade Laurasiathe-ria and possibly to Ferungulata. The zalambdalestids may belong to the Euarchontoglires (see p. 324) and to the Glires in particular, so confirming the presence of at least two placental clades by 85-90 Myr ago (Archibald, 2003). Other records in the literature of Late Cretaceous insectivores, primates and ungulates are doubtful (Archibald, 2003). These records have been critical in the current debate about the timing of the origin of placental orders (see pp. 323-5).